I almost forgot -- one of the reps from the Beltline who was there mentioned that she was involved in the environmental assessments for the three streetcar segments underway -- Beltline East, Beltline West, and Crosstown/North Ave/Luckie St. After the presentation I asked her what the status is on those reviews. She said that they'd received an initial response from FTA and were "re-packaging" the proposals (I didn't ask why). The federal review will help determine how the streetcar crosses Hulsey Yard, and how it connects to MARTA -- whether it goes west to King Memorial or east to Inman Park/Reynoldstown. I asked if they thought these lines could be the ones under consideration for November's transit referendum, and she said that they're hoping to have the federal reviews finalized by the end of the year, so that it's a possibility. Good news, and thanks for the report magnetar! Looks like we won't need to break out the rented machines and pick-ups on our own. Good, I kinda had plans! With or without you Fourthwarden I'm gonna build a pathway from Eventide up to the tracks! - ABI has given the contractor the OK to proceed. - Notice of Intent filed with state, hope to have it accepted quickly, which begins a 14-day comment period before construction may begin. - If that happens on schedule, plan is to begin construction the first week in June. - Construction is contractually mandated to be complete 12 months after it begins. - Wylie will be getting new storm drains to help prevent the frequent flooding seen in the Krog Tunnel. - Temporary lane closures on Wylie will be required to move the water main and curb. - Kirkwood, Irwin, and Wylie will all require temporary detours during certain phases of construction, to install a speed table/raised crossing where the Beltline crosses the street. - Work will begin on Wylie, then work south to Kirkwood. The last phase will be from the Krog Tunnel to Irwin. - Sections of the trail will open as they are completed. - Original alignment in 2011-2012 called for the trail to run on the east side of Bill Kennedy from Memorial to Faith Ave., then moving over to Chester Ave.
- Conflicts with I-20 exit ramps, Glenwood Place shopping center have inspired an attempt at redesigning. - Three new alternatives available: West, East, and Hybrid (east north of Faith Ave., west south of Faith). - New street planning options were presented for four segments: Memorial to I-20, the I-20 bridge, I-20 to Faith Ave., and Faith Ave. to Glenwood. 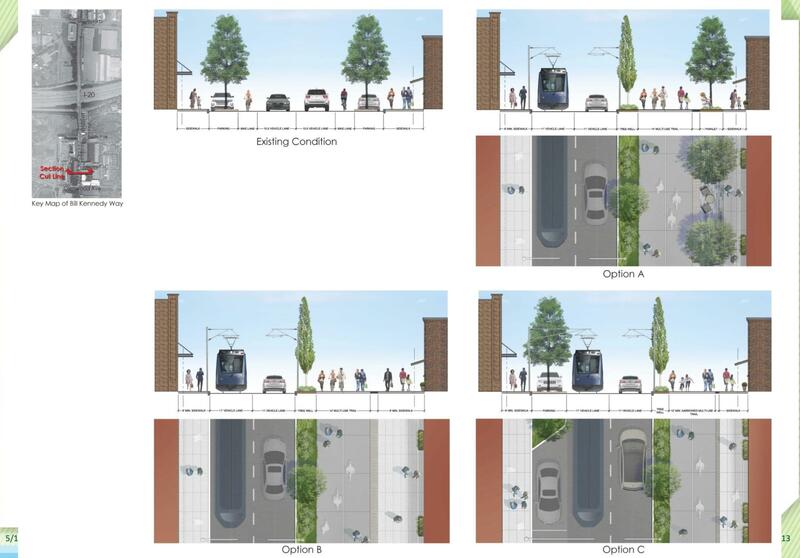 - The new street planning options change the street configuration on Bill Kennedy, removing curb parking and on-street bike lanes, in favor of wider sidewalks, a 14-foot multi-use trail, and social spaces that connect to the dining and retail on Bill Kennedy. Here's an example of one of the streetscape options. This shows current conditions on Bill Kennedy Way looking north from Glenwood, and three possible options for how the Beltline might be incorporated. Thanks for the updates magnetar! Only Option A or Option C.... do not like Option B with only one row of trees. Option C to preserve on-street parking for the Glennwood Park businesses. Myself and most of the neighborhood went with Option A. Giving the Beltline plenty of width was a priority over car parking. They also prefered the east trail alignment. Yep, I also noticed that on all of the boards, the option getting the most "votes" was the one that preserved the most space for pedestrians and cyclists, even at the expense of parking. That makes perfect sense since Reynodstown folks, and people in the surrounding neighborhoods, can walk or bike there just as easily as driving, and that will be even more true once the all new developments come online.